Issue quirks: 34 pages, no ads and no credits. 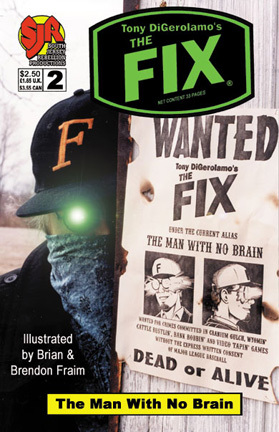 Issue Events: First Fix story that does not take place on Earth. Issue Synopsis: Pulled through a psychic vortex in his bathroom, Fix finds himself on a planet 300,000 light years away from Earth. The world is inhabited by strange aliens and a group of cowboys called "mindslingers". These psychic gun fighters are hunting for the ultimate mind altering crystal, but will Fix let them have ultimate power just to get a ride home?